When you want a dog collar that can stand the test of time, go for leather. It’s durable so you will have the peace of mind it can tolerate wear and tear. 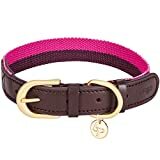 The problem is there are so many brands offering leather collars in different styles and colors. It’s quite tricky to find the one that is not just fashionable but also made of high-quality material. Comfort is the first thing to consider when choosing a collar for your pet. It’s the reason why Soft Touch made it on the top of our list. It’s made of naturally tanned leather, which means it is breathable enough for everyday use. There is a small ring near the buckle where you can put the tags. The brass hardware is lacquered to avoid corrosion and rusting. Plus they sell a matching lease in case you haven’t bought one. The matching leash is described as soft as the collar itself. What makes this collar unique is its combined polyester and leather material. Not bad, especially when you are caught between a polyester and a leather collar. The webbing is made of polyester, which is great idea since it adds to its comfort and flexibility. But what really caught our interest is the muted brass tone hardware. The metal buckle was lacquered with an eco-friendly brass color. It’s a simple collar made stylish by the hardware because of its vintage effect. Logical Leather offers the collar in a variety of sizes, ranging from extra small to extra large. You can find a size that will fit your buddy regardless of his size. It’s a good choice when you want to buy one for a weeks-old pup since there are limited options available for very small dogs. There is nothing so special about the design but quality-wise, we cannot question its durability. This padded collar will be suitable for active dogs because it made with Military and Law Enforcement grade. Because of its durable heavy-duty lining and high-quality hardware, this would be perfect even for the most hyper dog breeds. It’s comfortable to wear, thanks to the padded sheep skin lining. It will not leave your pet’s skin irritated. This one’s sturdy enough for long walks and hikes because it’s made of full-grain leather material. Just by looking at its corrosion-proof solid hardware, you can see that it’s going to last for months and even for years! 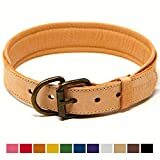 It’s a bang for the buck because you can already get a genuine leather collar for your pet at such a price. Although the leather looks thick, it’s actually soft and supple so you would not have to worry about comfort. It’s only available in color brown which is not a problem when you are not picky when it comes to color. It actually has a natural russet leather shade that makes it look elegant. Meanwhile, Taglory sells a matching leash that is also made of real leather. 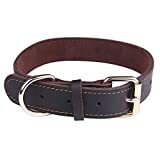 What makes Perri’s collar unique is that their leather products are handmade by Amish craftsmen in the United States. In case you are not very familiar with them, they are known for their quality leather that are all very detailed and are carefully crafted. 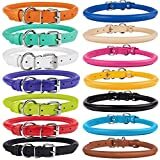 These collars look stylish too because there are so many colors available. Our favorite part is that it’s gentle on the pet’s skin because of the lambskin padding. It’s a hypoallergenic material that is suitable even for dogs with sensitive skin and prone to skin itching. Leather itself should not irritate your pet’s skin if it’s made of high-quality material. Stay away from faux leather because it may be treated with chemical that can inflame the dog’s skin. This one boasts a nice stitching, which only proves that it’s really handmade. But the selling point is its thickness—you’ll have the confidence that it’s going to last for quite some time. T’s great for starters who are skeptical to try leather. You can easily clean this collar with a soft damp cloth, since it is genuine leather. This one’s worth buying when you prefer a simple but durable collar for your fur baby. 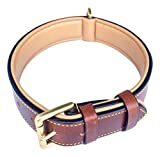 It’s made of genuine leather but it’s one of the cheapest leather dog collars you could find. It’s thick enough that makes it suitable for everyday use. But what we really liked were the beautiful colors! You have a lot of options unlike other brands that only offer black or brown. The mint green and the pink are beautiful and will give your pet an instant fashionable look. Hamilton’s collars are classy. They have a minimalist look but you can judge even from the picture that they are made of the finest material. Plus, they are not as expensive as other brands out there! What makes this collar different is its rolled built. It’s not too thick unlike flat leather collars in the market. This one’s worth trying since it is not too thin to put some pressure on the neck. A common issue with rolled or round collars is they may damage the pet’s fur or put a pressure on the windpipe. This issue can be solved by letting your pet wear a rolled collar loosely. Consider getting a flat one though if you got a puller right there. Hamilton also flat collars, which are more suitable for puppies. It’s a bit pricier than the other leather dog collars but this is because they are specially made for large dogs. Plus it also offers a lifetime guarantee so you have the peace of mind that you can easily return it without a problem. But since it is made of the finest quality leather, we doubt you’ll have an issue with this collar. The best part is you have the option to personalize the collar—a great feature since you no longer have to put a tag. It’s hands down one of the most gorgeous collars you could ever find! The thick yet pliable leather will give your pet an instant fabulous look. Yet we appreciate that this one also looks sturdy enough. While it looks nice and durable, it doesn’t sacrifice comfort because it’s made of durable leather. Several reviews claim that it can withstand rough and tumble—a nice investment when you got a very active dog. 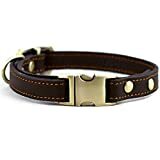 A common issue in buying online is receiving a collar that is either too big or too small for the dog. Use a tape measure to determine the size of the neck. Add two inches for the exact measurement. It’s worth investing in genuine, natural, and organic leather because it can withstand heat and humidity. Genuine leather absorbs water while the synthetic type does not. They have a good heat insulation property, which you cannot find with faux or synthetic leather. Most people are hesitant to buy a leather collar for their pets, believing that it’s difficult to maintain. But the truth is leather will be suitable for everyday use as long as it is made of genuine and quality material. Besides, the cleanliness of the collar depends on the neatness of the dog itself. So make sure that your pet’s bathe frequency is appropriate for his lifestyle, coat, and breed. There are specific breeds that don’t require lots of grooming while there are breeds that should be bathed more. The dilemma is that it may be difficult to spot authentic leather from faux leather. The real one feels smooth or coarse when you touch it. When it comes to the pores, you can expect the authentic ones to have an inconsistent pattern. It matters to know the difference of real from fake leather. There are brands claiming they are selling authentic leather when they are really not. Don’t be fooled by sellers of fake leather collars. There you have it! Do you have a certain brand that deserves to be on the list? Feel free to share them on the comment section.